The Tartan Quality Mark is the hallmark of premium quality Scottish salmon. Each fish has been produced to strict guidelines set down by an independently controlled product certification scheme and has a unique identification number which allows it to be traced back to the farm. Mix the potato, flour, milk, eggs and seasoning to make a smooth batter. Stir in the onion and salmon trimmings. Heat a frying pan, add a little oil and drop in a large spoonful of the mixture. The mixture should make about 6-8 pancakes, each 8cm diameter. Cook each side for 1-2 minutes over a medium heat or until golden brown. Set aside and keep warm. Heat the olive oil in a frying pan, add the slices of lightly smoked salmon fillet and cook for 1 minute each side. 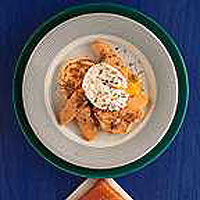 To assemble the dish, arrange 2-3 pancakes on each plate then a layer of the cooked salmon and top with a poached egg. Garnish with fresh dill and serve.